IS THE U.S. TRADE DEFICIT A NATIONAL PROBLEM? You may have heard the press call the United States the world’s largest debtor.The nation earned that description by borrowing heavily in world financial markets during the past two decades to finance large trade deficits. Why did the United States do this, and should this event give Americans reason to worry? To answer these questions, let’s see what the macroeconomic accounting identities tell us about the U.S. economy. Panel (a) of Figure 2 shows national saving and domestic investment as a percentage of GDP since 1960. Panel (b) shows net capital outflow (that is, the trade balance) as a percentage of GDP. Notice that, as the identities require, net capital outflow always equals national saving minus domestic investment. 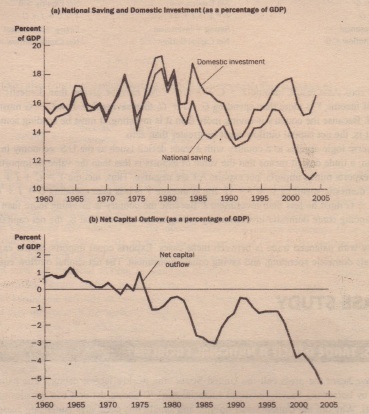 The figure shows a dramatic change beginning in the early 1980s Before 1980, national saving and domestic investment were close, and so net capital outflow was small. Yet after 1980, national saving below investment, and net capital outflow became a large negative number. That is, there was a capital in flow: Foreigners were buying more capital assets in the United States than Americans were buying abroad. The United States was going into debt. History shows that changes in capital flows arise sometimes from changes in saving and .sometimes from changes in investment. From 1980 to 1987, the flow of capital into the United States went from 0.5 to 3.1 percent of GDP. This 2.6 percentage point change is largely attributable to a fall in saving of 3.2. Are these trade deficits a problem for the C.S. economy? 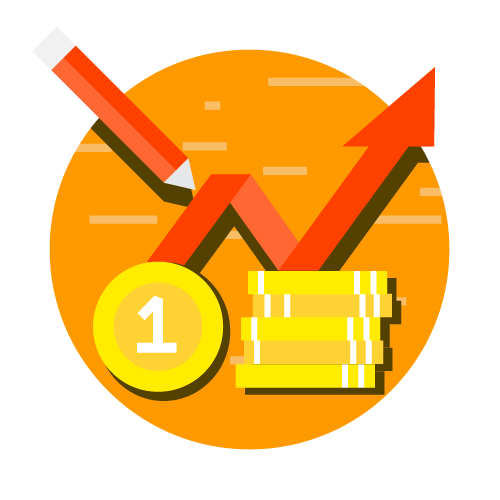 To answer this question, It is important to keep an eye on the nation’s saving and investment. wages. In other words, given that U.S_ saving has declined, It is better to have foreigners invest in the U.S economy than no one at all. Now consider a trade deficit induced by an investment boom, such as the trade deficits of the 1990s. In this case, the economy is borrowing from abroad to finance the purchase of new capital goods. If this additional capital provides a good return in the form of higher production of goods and services, then the economy should be able to handle the debts that are being accumulated. On the other hand, if the investment projects fail to yield the expected returns, the debts will look less desirable, at east with the benefit of hindsight. There is no simple and correct answer to the question posed m the title to this case study. Just as an individual can go into debt in either a prudent or profligate manner, so can a nation. The trade deficit is not a problem in itself, but sometimes it can be a symptom of a problem.